The air curtain is an ingenious invention, creating a completely transparent, seamless and mostly penetrable barrier between two spaces. Originally invented and patented at the turn of the century, they moved into more wide scale use in Europe throughout the 1940s and 50s and entered the American market in the 1960s. Today air curtains are a staple for many commercial business owners who have a vested interest in protecting temperature fluctuations, energy efficiency or quality control inside or between two spaces. They are also more visually appealing and customer-friendly than plastic strip doors, which may be fine in B2B locations, but are cumbersome and unsightly when curb-appeal and easy customer access is desired. The conceptual workings of an air curtain are quite simple. In most cases, the equipment is mounted at the top of an entry or opening between two spaces. For a recirculating unit, an air intake systems draw air in, accelerates the air via a fan unit, and then delivers a consistent stream of continuously flowing air across the width of the opening. The distribution nozzle is adjustable within a certain number of degrees to direct the flow of air inward or outward. The effect is an efficient jet stream, where roughly 80% of the air is returned to the intake and the other 20% moves in the opposite direction. There are also non-recirculating systems, typically mounted vertically along the sides of the opening. If the opening is wide enough, it requires more than one system to work correctly. Also, it’s worth noting that side-mounted, horizontal air curtains are more prone to damage so protective measures should be taken. How the door is used, i.e. a loading dock, deliveries, shipments, entrance or egress of employees and/or customers, between freezer or cooling units, etc. The results of this review will determine which type, size and power rating will be best for your particular use. Installation of an air curtain saves business owners time, money and energy. First, the air curtain provides unobstructed movement between spaces – no waiting for doors to open and close. This saves time for employees and makes your business more appealing from the curb. In fact, studies show that business increases in response to the open door effect. Open doors draw people in – so your air curtain allows your brick-and-mortar front door to remain open without the typical risks of heating/cooling loss or excessive energy bills. Also, your business will be more appealing to those with mobility issues or disabilities because there is no cumbersome door to manage. The air curtain will preserve the temperature differentiations between two spaces, keeping the warm air on one side and cooler air on the other. In addition to increasing both staff and customer comfort, you’ll also notice a distinct improvement in energy savings. Energy savings come indirectly as well, via less wear-and-tear on your HVAC system since the blowers and air handlers kick on/off less often. Also, regular cleaning and minor maintenance of the air curtain on a regular basis minimizes overall maintenance, repair, and replacement costs. The same high-pressure air flow that prevents temperature exchanges is a deterrent for insects and pests. Air curtains also prevent the migration of dust, contaminants, odors and pollutants between two spaces, increasing quality control. Company safety is also enhanced. For example, air curtains used in cold room doorways prevents misting, which reduces icy and or slippery surfaces that put employees at risk for injury. The lack of obstructions also reduces the chance of employee and/or equipment collisions. 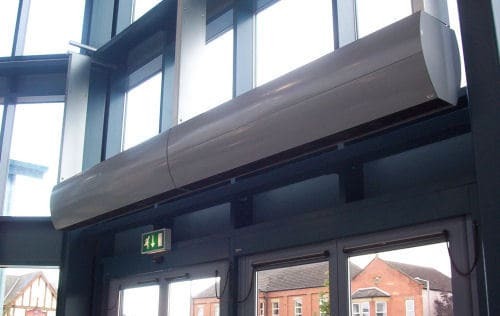 In fire situations, the air curtain forms a barrier, preventing smoke from infiltrating the space and also provides a clearer path for employee and customer evacuation. If you’re considering installing air curtains at your place of business, select a reputable and experience air curtain installer. Failure to select the correct unit can be a costly mistake. The airflow from the air curtain won’t be adequate enough to provide the advertised benefits, and you’ll wind up with an expensive lesson and extra expenditures returning and replacing it. Better to have the right unit(s) selected the first time around. 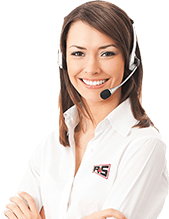 Contact R&S for a free on-site consultation so we can determine which air curtain units would be best for your business.